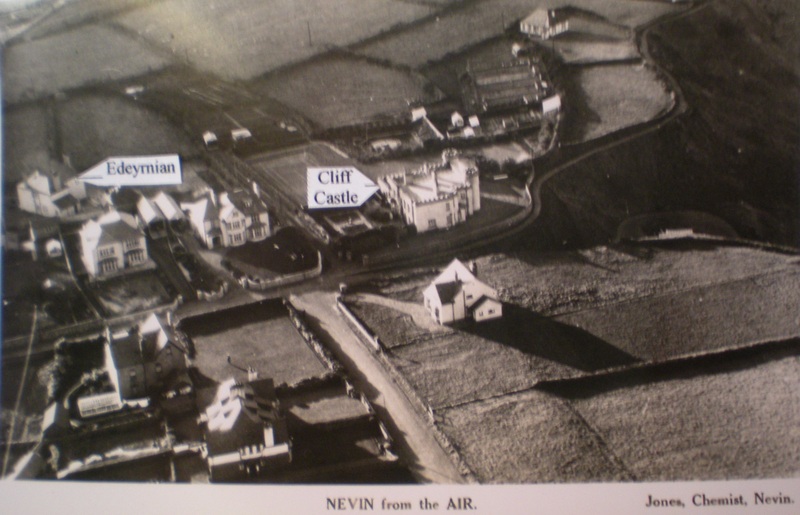 Nefyn aerial view taken in the 1930's near the top of Screw Road (right side center). There are no houses behind Cliff Castle, and very few along the cliffs. 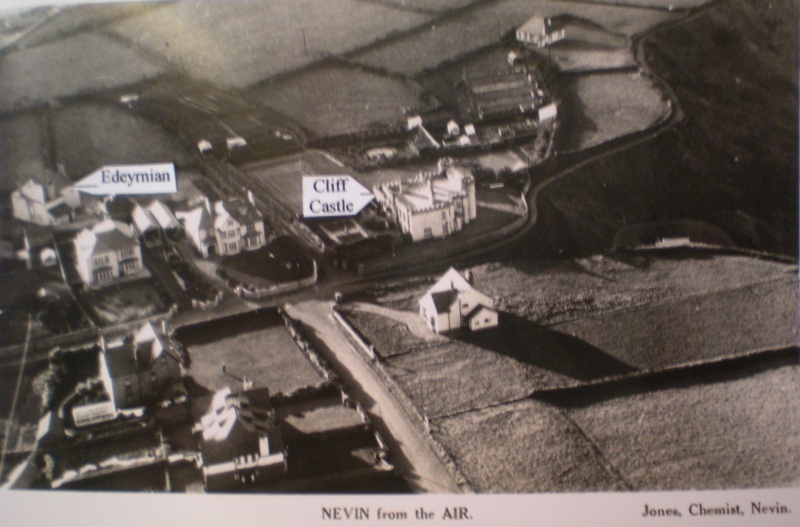 There is no sign of Glan-y-Pwll, Tai Newyddion, or the Prisoner of War (POW) camp along the Morfa Nefyn road (upper left corner). I have no idea how Jones the Chemist arranged to have this photo taken. 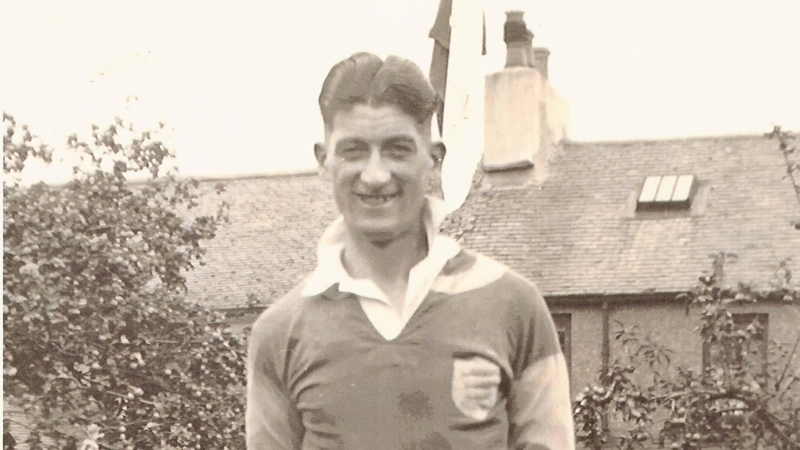 Photo courtesy of Emrys Parry. 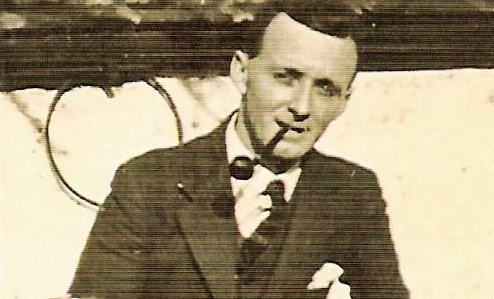 Richard Owen Jones (1912-1975) master butcher Glyllifon Stores, and son of Owen Jones. Photo courtesy of Hefina Yates. 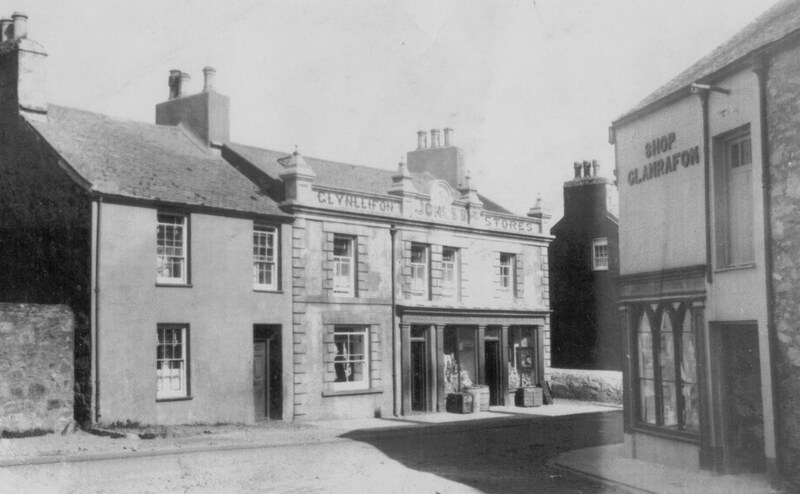 Glynllifon Stores, High Street with the butcher's on the left and the grocer's on the right. The grocer's later became Glyn Cafe (Cafe Pyrs). 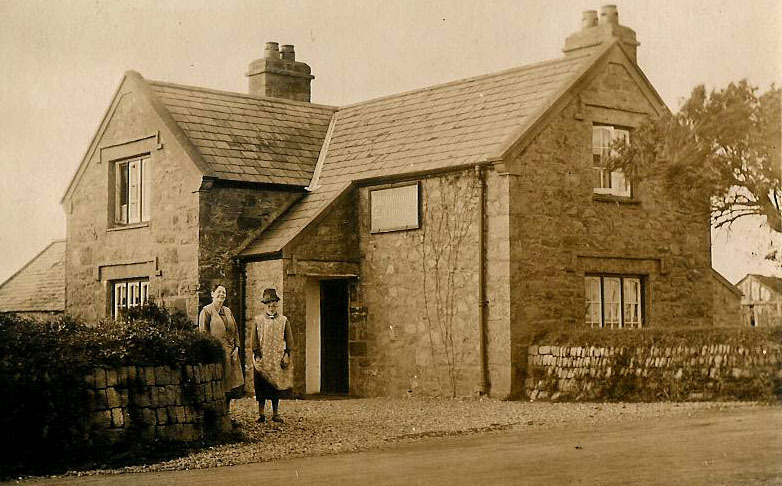 The house on the left eventually became a greengrocer's owned by Griffith Griffiths (Giddy Gids). A new house built at the wall on the extreme left later became a Fish and Chip shop owned by Thomas Jones. Shop Glanrafon across the street became a draper's owned by Morris Jones. Morris Jones owner of the drapery Shop Glanrafon on High Street. Robert (Robin) John Jones (1877-1944) chemist High Street and his wife Mari Elizabeth. 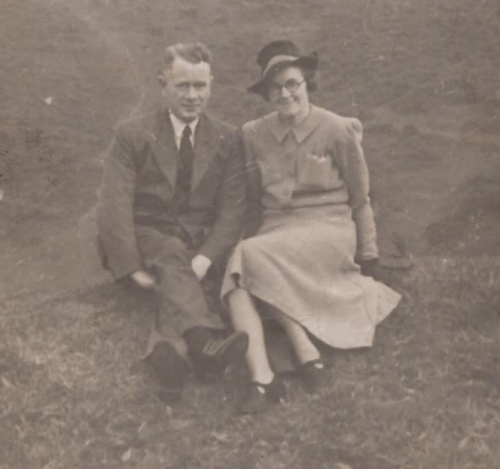 Robin was also an expert photogtrapher publishing many postcard photgraphs of the Nefyn area. The Nefyn Football team of the 1930's. 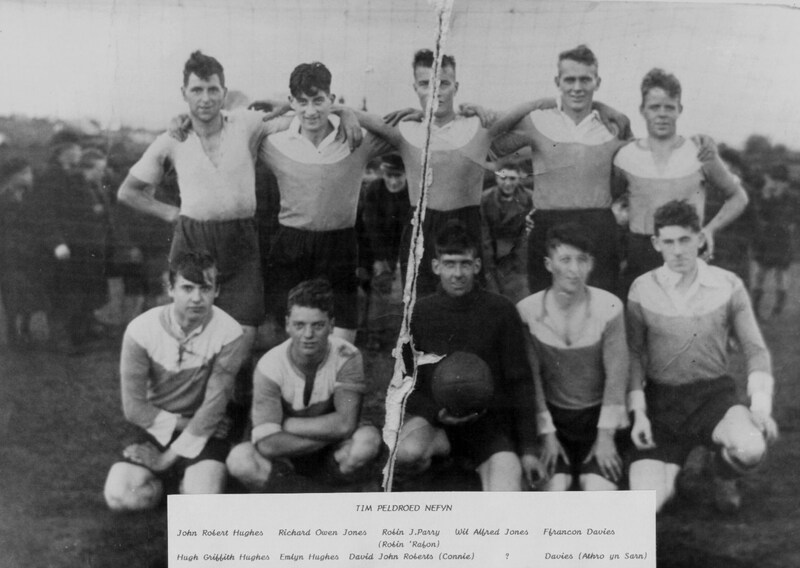 Top row: (left to right) John Robert Hughes; Richard Owen Jones (Dic Owen); Robin J. Parry (Robin Rafon); Wil Alfred Jones (Wil Alf); and Ffrancon Davis. Front Row: Huw Griffith Hughes; Emlyn Hughes (Emlyn Bwlch); David John Roberts (Connie); unknown; unknown. Missing from the photograph is Towan. 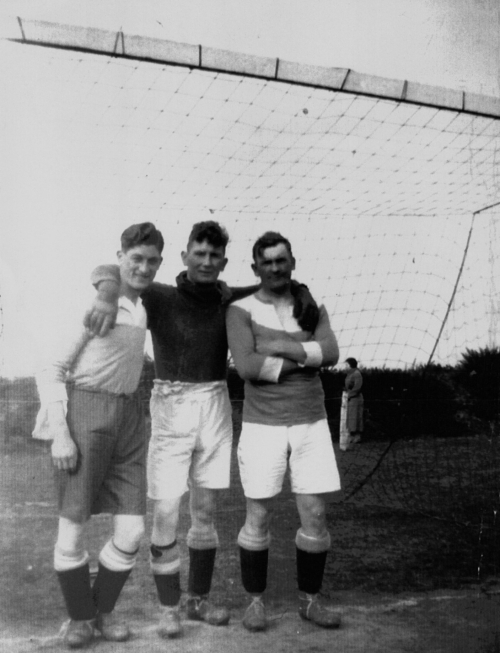 Members of the Nefyn Football team. From left: Richard Owen Jones, unknown, and Hugh Griffith Hughes.